If you love dogs as much as we do you probably read reviews on food, toys, and parks before you buy or take your dog there right? Well, you'll love our reviews on all things doggie related. We are reviewing products, services, and places to visit... check em out! Bristly Dog Toothbrush Toy Review: Pros & Cons Of The Bristly Brushing Stick (aka Brite Bite Dental Stick) – It’s Easier Than Brushing Your Dog’s Teeth Manually! The Bristly dog toothbrush is a special chew toy that functions as a toothbrush for dogs. Who doesn’t need a little help brushing their dog’s teeth??? If there’s an easier way to do it… I’m all in! Dog teeth brushing is one thing that is not all that easy to do. I still do it with all 3 of my dogs — but it’s not what I’d call fun. The Bristly dog toothbrush toy is a FUN way to brush my dog’s teeth! The best part: he does all the work, not me. Here’s my review, including the 10 things I like best and 3 things I’m not so crazy about. But the bottom line is my dogs LOVE it! We have 3 dogs and 2 vehicles. We use the 2-in-1 iBuddy dog cargo cover / dog car hammock to protect the inside of our SUV from dog fur, dog drool, and dog toenail marks. See why I mostly use this dog seat protector as a cargo liner — and why I love it! Did you realize that you can make over $500 a month dog sitting? As a pet sitter in Seattle, I’ve learned a few things along the way to make dog sitting more profitable and fun. Here are my best tips on how to start offering dog sitting services on the side to make extra money. Best Pet Brush: See Why The Furminator Dog Brush ROCKS! I’ve found a pet brush that blows the others away. It’s called the Furminator! It’s my all-time favorite dog brush, after trying 3 others. Here’s why. 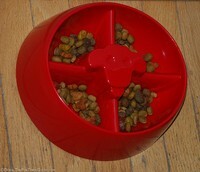 PAW5 Rock ‘n Bowl Review: It’s A Slow Feed Dog Bowl & Interactive Puzzle Toy For Dogs! Katz on Dogs is one of the best dog training books. It addresses all of the questions a new dog owner would have – whether it’s your 1st dog or your 5th! A Better E-Collar For Dogs: This Inflatable Dog Collar Works Great! Looking for a better e-collar for dogs? Try an inflatable dog collar. It worked great for us! My dog took to it much faster than a plastic dog cone collar. My dog’s first experience with Mercola Healthy Pets Treats. We tried the large Dental Bones and the Gentle Dental Bones. My dog LOVES these dental chews! This is one of the best leashes for dogs – especially for big dogs AND for dogs that pull – because of the shock-absorbing features that are built-in. Ever use a dog dry shampoo? I tried it on my dog and… I like it! Here’s my review of Fresh Dog Waterless Bath Foam Shampoo & Fresh Dog Dry Shampoo Powder. 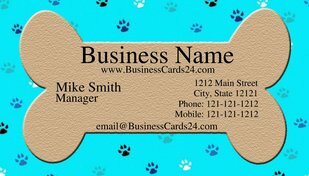 Create Professional Dog Business Cards… In Minutes! No, these aren’t business cards for your dog. (Well, I guess they could be if you wanted them to be — if your dog is that popular at the dog park!) These are business cards for dog lovers. I can think of lots of ways that these cards could be useful. Freshpet is the only brand of fresh, refrigerated pet food in the stores (in the pet food aisle). 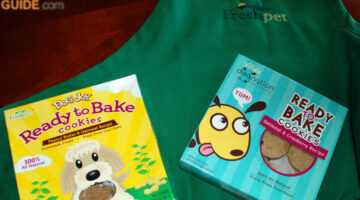 See why I – and my dog – LOVE Freshpet Ready to Bake Cookies for dogs. Dog Bad Breath Remedy: Doggie Mouthwash (A Drinking Water Additive) Worked For Us! I’ve tried dog mints in the past. They had no effect on my dog’s bad breath. Those granules that you sprinkle on your dog’s food are so darned expensive. So I decided to try doggie mouthwash; it’s a drinking water additive. Dental Fresh got rid of my dog’s fish breath once and for all! Clicker Leash: It’s A Double-Duty Dog Leash With A Built-In Clicker! What makes the Clicker Leash unique is one thing: the fact that it has built-in clicker! I tried the Clicker Leash with my dog. Here are the pros and cons of the Clicker Leash, as I see it. President Obama’s dog Bo uses a Clicker Leash! Which Social Network For Dogs Has the Best Facebook App? Looking for a social network for your pup but don’t know which one to choose? Check out this rundown of the best ones, including how they integrate with your Facebook! Social networking is all the rage — even when it comes to finding friends of the four-legged kind! Thanks to Doggyspace, dogs and their owners have a place to gather online and share stories, videos, pictures, and more. I encourage you to check out this fun online community of dogs and dog owners. If your dog eats too fast or gulps food quickly, this partitioned dog food bowl by DogPause might be the solution you’re looking for. It’s a fun way to get your food gulper to eat slowly! GoughNuts Dog Chew Toy Is Virtually Indestructible… Guaranteed! We recently introduced the GoughNuts dog toy to our dog, Tenor, for the first time. Think: A ‘doughnut’ that dogs go nuts for. He immediately lOVED it! Does your dog like to play with old 2-liter bottles? Mine does. 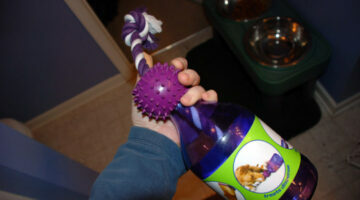 Here’s a REAL dog toy that is similar to a 2-liter bottle… but safer, and lots more fun for the dog. It’s called the Tug-A-Jug interactive treat toy for dogs. In the book, Planet of the Dogs, the dogs do all the teaching and the children — and adults alike — take it all in and learn very valuable lessons. In the end, humans become all the wiser — and much better people — thanks to their time spent in the company of dogs. There’s no doubt about it, our dogs have gotten years of enjoyment out of Kong toys. We currently own 16 of ’em! And we, in return, have gotten a lot of peace & and quiet — and content dogs — thanks to Kongs!